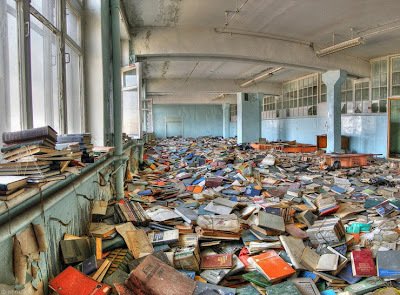 Yet another reason to love the UPPERCASE gallery - today they posted this drool-inducing photograph of an abandoned Russian library. What I wouldn't give to tote my 35mm around in that room! The curling paint on the wall reminds me of curling Baroque scrolls - almost too good to be true. Originally posted at this Russian blog, you will do better viewing the remaining photos here (English makes it a bit easier to navigate).